We had a day of 20 (68F) degrees last week. It was a bit windy though and did not feel like 20. Not bad for winter, all the same. But how exciting. Tomorrow it will only reach 11 (52F) degrees and there will be snow down to 500 metres. See the hills in the background of my header photo? 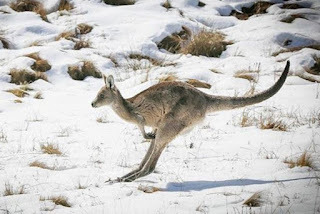 They are known as the Dandenong Ranges, or just The Dandenongs and the forecast is the highest parts will get a 5cm snow covering, the best fall for ten years. I bet when you think of Australia and kangaroos, this image from ABC would not be the first picture that pops into your head. How long should a tablet computer last? Four years, apparently. Not even that if I date it to when it first began to give trouble. It was taking a long time to recharge the battery and was going flat quite quickly. I had the screen brightness turned down to about 1/3 and within about 3 hours of use, it would be flat. Use it plugged in to the power, it was better, perhaps 5 hours. It should last about 10. Sometimes it would take all day to charge, and other times reasonably quickly. Replace the battery, you might think. I did and so did the man at the phone repair shop. I paid a deposit of $30 as the battery had to be ordered, and the new battery installed was going to be about $65. Given the tablet cost me over $600 when new, that is quite reasonable. A call from the phone repair man told me that there was something else going on and even the new battery wasn't taking charge like it should. He said he would investigate further and came to the conclusion that it was a problem with the motherboard (why are mothers so troublesome) and it was not worth repairing. I could pick it up and there would no charge. I did not ask about the deposit. But before taking it there, I watched a Youtube clip demonstrating how to replace the battery. The hard part is not replacing the battery but separating the front from the back. It is a matter of having the right tool to lever them apart and patiently working you way around the screen a couple of times. The battery if bought in the US comes with the tool. I collected the tablet today. The repair man seemed to avoid me. I tried to switch it on. It wouldn't turn on. Well, it has been sitting here for a couple of days and not charged. The battery would be flat. I was refunded the deposit and I brought it home. I noticed it was not sitting quite correctly in the frame. I pressed down around the edges and almost had it right, but then I realised that there were marks where a tool had slightly bent the frame. Oh well, barely noticeable. I plugged it in. Nothing. Maybe the battery was so flat it could not indicate it was even charging. I left if for half an hour and still nothing. The charging plug on the wall was cold when it should have warmed a little. It is........buggered. That is not very good. It was working when I took it in and now it is not. I could have managed for a while with how it was, but I had decided to buy a new one before we travel in October once I knew the new battery would not fix the problem. Now a new tablet is a priority. I love to lounge on the bed early morning and late afternoon while R naps, playing with my tablet, and it brilliant to have when travelling. It was a Samsung Galaxy Tab S 10.1" (screen size), and as I said, cost over $600. The same one is not available now and the equivalent seemed to cost even more. Isn't technology supposed to get cheaper over time? Samsung is now in the position to able to put a premium price on their products. I have pretty well chosen a replacement for $300. After checking the stock supply at the store, I will pick it up tomorrow. It won't be quite as flash, but should do what I expect of it and it has received generally good reviews. Then will come the task of customising it to how I like things, connecting up wifi, download apps, arranging the screen. I hope my old case will fit it, or I will have to buy a new case too. The new one is Lenovo Tab 4, 10" Plus, 16GB, Full HD Tablet in White (which no one will see as it will be in a black case, not that anyone else really sees it anyway) I use it in private mostly, but it is great to have it for travelling with. I can transfer and back up photos. I have a big enough screen to see maps. It browses the internet well. 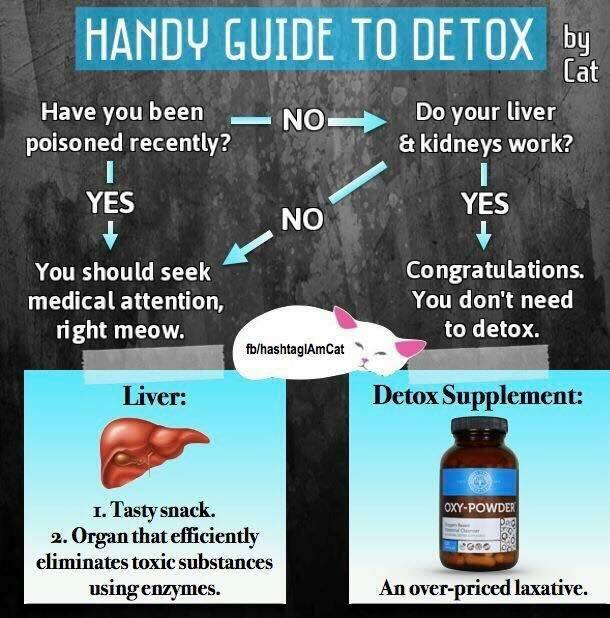 It works just like my smartphone and has apps. It is better in some areas as phone and not as good in others. Lordy, BAD is still in New York. She has a habit of picking up gay men to kiss and rich men to marry. Will she become BAD Rockefeller? The song that I came to dislike because it was overplayed on radio was Otis Redding's Dock of the Bay. (stealing EC's effective writing style) It was played every day. More than once a day. For weeks. For months. Ah, I didn't know he was black. Oh, sad. He died at the age of 26 in 1967 in a plane crash. BAD is in New York City. I may well have written a similar post in the past about the clocks, but hey, indulge me. 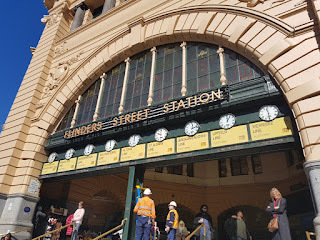 I've mentioned Flinders Street Station a few times of late. I am fond of it. It is the major train station for our suburban trains and externally, it is a wonderful beast. Not so historic nor nice inside, unfortunately. 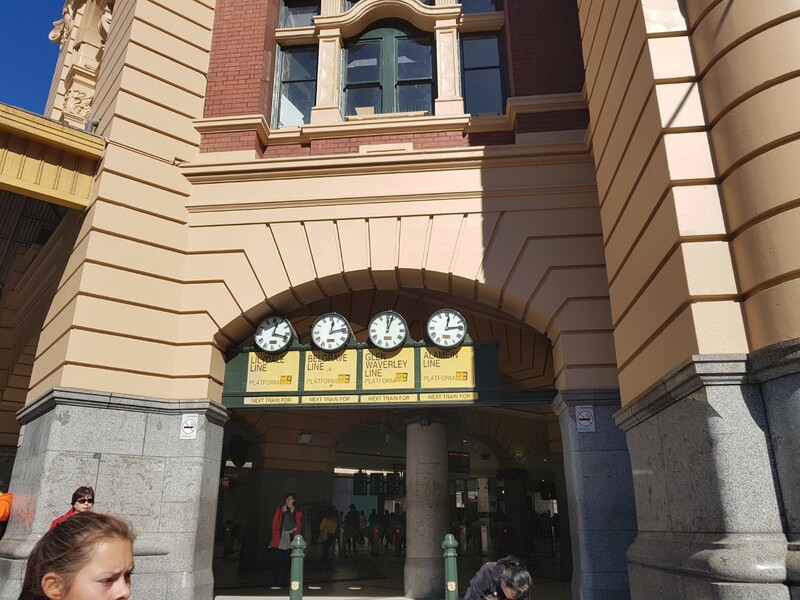 These clocks above the steps up to the station indicate the train departure time on various train lines, helpful to those who see their train will soon depart and dash across Flinders Street in great haste. There were once altered by a man with a stick and there were also some drop down displays that he would change, giving a little more informations, such as Express to Caulfield. I don't remember them showing the platform as they now do. The state government wanted to save on the labour costs of having a dedicated person changing them constantly, and so decided digital display would replace them. That was such an outcry that the government backed down and decided to electrify the existing clocks instead. It was and perhaps still is a meeting place for people. Meet you under the digital display doesn't quite have the ring to it like, meet you under the clocks. A while ago the clocks failed. Perhaps they were switched off while the station was repainted and relit. It appears in the photo that workers are attending to them. But our at times rather stupid government keeps changing the names of terminating suburban stations, so if you don't know which old line your train is on, bad luck. As I have argued before, the lines should be named not by a station but a line name, as is the case in London or by a letter, such as New York. One sign has been updated though, with the addition of Cranbourne to the Pakenham line, with the Pakenham line once being the Dandenong line. Now even I can't remember what all of these lines now are. Let me check. The Broadmeadows line is now the Craigieburn line. St Albans was changed to Watergardens but is now the Sunbury line. Ok, only two on this bank of clocks. To the left around round the corner are some more, but none of these have changed names. But where are the clocks for the Epping and Hurstbridge lines? Epping changed to South Morang and is about to change again to Mernda. I was scratching my head for a minute as I realised they have never been there, well not in my memory. Ah ha. Those two lines departed from another station with its own entrance, now demolished, just across the road called Princes Bridge Station. The two stations were kind of connected by platforms below the road and once had platforms 12, 13, 14, 15, and 16. As far as I know, only 12 and 13 are still used, usually by the Sandringham train, and how I hate being dumped there or having to catch a train from there. I must check if there are any other platforms there still. With most people used to a precise minute digital display, the clocks are probably rather redundant now, but I am so glad they have been kept. There used to be some at Princes Bridge Station, Spencer Street Station and South Yarra Station, all long removed now. I am never quite sure or the meaning of irony. After two nights of tossing and turning and not sleeping well as I decided what to write to Mother's property investor neighbour next door, it has suddenly occurred to me that R and myself, among other reasons, moved to The Highrise so that we did not have to deal with such things as old fences and falling trees. We don't have to worry about external matters here. We just pay the body corporate/owners' corporation payment and it is not our problem. While I am not sure if I am correct, oh the irony of bad sleeps worrying about Mother's fence and tree. I thought I had such personal things nailed. It strikes me that the people who write computer code and design and maintain technology systems are well paid. Yet the person who has to answer the telephone in a call centre who has a script to follow and deal with irate or technology illiterate people, that is pick up the pieces that well paid tech people have failed to get right, gets quite poorly paid. Humans are an unknown thing, so it takes quite some skill when dealing with humans at the end of a telephone line. It is skill some of us have and some of us don't. We could all learn computer programming and other tech stuffs. Perhaps I am little unfair on the techies. What about those who move huge amounts of money around the world and make obscene amounts of money, or heads of corporations that get paid seven or eight figure sums annually. Bone Doctor is now a GP, a general doctor. If she has become rich in her profession, she is not telling us and is not showing any signs of great wealth. She and Sister are comfortable and very mean with themselves in some ways. People who work in childcare and early development are paid a pittance. Surely those who are part time bringing up our children should be very well paid. Aged care workers and nurses? We will probably all need them at some point in our life and decently rewarded worker will generally be much happier in their job. Even school teachers are not well paid and for the responsibility they carry and the skills they need, school principals are very underpaid. You could probably add more to list of those who are underpaid in society. I wonder how this huge disparity came about. It wasn't always as extreme as it now is. Something has gone really wrong somewhere. Not much time, so here is a quickie. This coincides with my opinion.